Is it possible to hear you play? Yes. I offer a free consultation to anyone planning their wedding ceremony. I can play different selections for you and we can select the music for your ceremony. Please contact me if you would like to make an appointment. For online samples please see the Listening Room page. How far in advance should I book a harpist for my wedding? Ideally you should book your harpist as soon as possible, espescially if your wedding falls on a Saturday during the spring and summer months. There is, however, no fixed amount of time you should book in advance. Some couples book up to a year in advance and others book a few weeks before their ceremony. It just depends on availability. Can you play outdoors and will the sound carry? Yes. I frequently play at outdoor weddings. Occasionally, there are special requirements or limitations but I am always willing to discuss your particular venue with you. The harp that I always play on is a Concert Grand or a Pedal harp. These are large instruments with extended sounding boards which allows for the sound to carry and resonante, even outdoor. I have played at many outdoor weddings and have found that sound of the harp always carries. I play a variety of musical styles including baroque, classical and romantic music such as Bach, Beethoven and Debussy. I also have a large selection of pop, contemporary, and Celtic music. For more ideas please see the Listening Room page . What if I want a specific song for my wedding? I am always willing to take special requests. Most songs with a melody will work well on the harp. Does the sound of the harp carry? Yes. The acoustics of the harp are such that the sound carries very well, even for outdoor weddings. The harp usually does not need a microphone for wedding ceremonies or small receptions. If, however, you are planning a reception or an event with 250 people or more it is a good idea to check with the venue about using a sound system. At wedding ceremonies I usually play for approximately an hour, including the prelude music while the guests are being seated. For receptions I can play for between 1 and 4 hours. Between two and three hours is usually appropriate for reception music. How long have you been playing the harp? 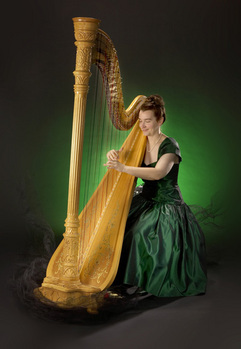 I have been playing the harp and performing at weddings and other special occasions for over 20 years. I am classically trained and have extensive experience helping people plan their wedding music. I play a full-size Concert Grand or pedal harp (what you would see in an orchestra). This allows me to perform the greatest variety of repertoire and musical styles. It also produces the fullest sound possible for a harp. I only require enough space for my harp, my chair and my music stand. Approximately 3-4 square feet would be ideal. This also makes the harp an excellen choice for intimate venues, especially where space is limited.